Jakarta, 16 June 2015—In November 2015, the leaders of ASEAN signed “ASEAN 2025: Forging Ahead Together,” charting the region’s direction in the next decade. The document succeeds the “Roadmap for an ASEAN Community (2009-2015)” and consists of the (i) Kuala Lumpur Declaration on ASEAN 2025: Forging Ahead Together, (ii) ASEAN Community Vision 2025, (iii) ASEAN Political-Security Community Blueprint 2025, (iv) ASEAN Economic Community Blueprint 2025, and (v) ASEAN Socio-Cultural Community Blueprint 2025. As ASEAN moves forward as an integrated region, with the formal launch of the ASEAN Community in December 2015, it envisions an ASEAN Economic Community that is “highly integrated and cohesive; competitive, innovative and dynamic; with enhanced connectivity and sectoral cooperation; and a more resilient, inclusive, and people-oriented, people-centred community, integrated with the global economy.” In line with building “a resilient, inclusive, people-oriented and people-centred ASEAN,” strengthening the role of the private sector is an identified goal. The ASEAN Political-Security Community Blueprint 2025 also aims to “[i]nstil the culture of good governance and mainstream the principles thereof into the policies and practices of the ASEAN Community,” including by supporting initiatives to promote and nurture corporate social responsibility. Thus, efforts that encourage responsible business are key not only to ensure that human rights are respected in the business context, but also to contribute to the process of ASEAN integration. 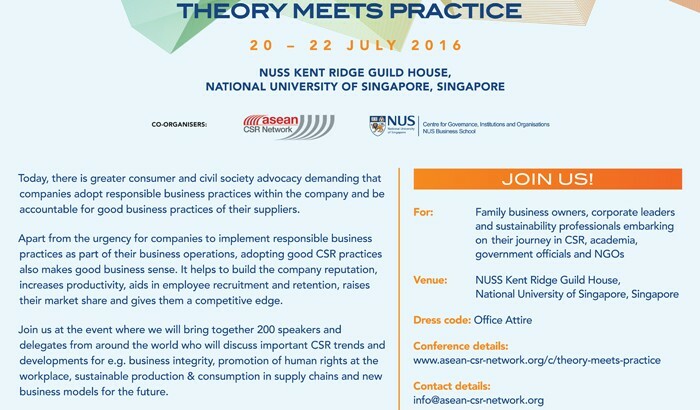 In this regard, the HRRC is pleased to announce that a “Conference on Corporate Governance & Responsibility: Theory Meets Practice” will be hosted by the ASEAN CSR Network (ACN) and the Centre for Governance, Institutions and Organisations, NUS Business School (CGIO) from 20-22 July 2016 in Singapore. Participants will be discussing current trends and developments in responsible business with seasoned practitioners from regional companies, regional and global civil society organisations and academia. The forum is also hoped to generate understanding on why incorporating responsible business practices in business operations is imperative in light of the changing global and ASEAN landscape. Academics and students enjoy a special rate for the conference. Academics may use the coupon code ACN-ACD upon registration to enjoy a special rate of S$250 for the event. Students pay only S$150 for registration, using the coupon code ACN-STD. For more details of the conference, please visit ACN’s dedicated webpage or email info@asean-csr-network.org. Instructions on registration are available on this link. ASEAN, Business & Human Rights, News, Singapore. permalink.